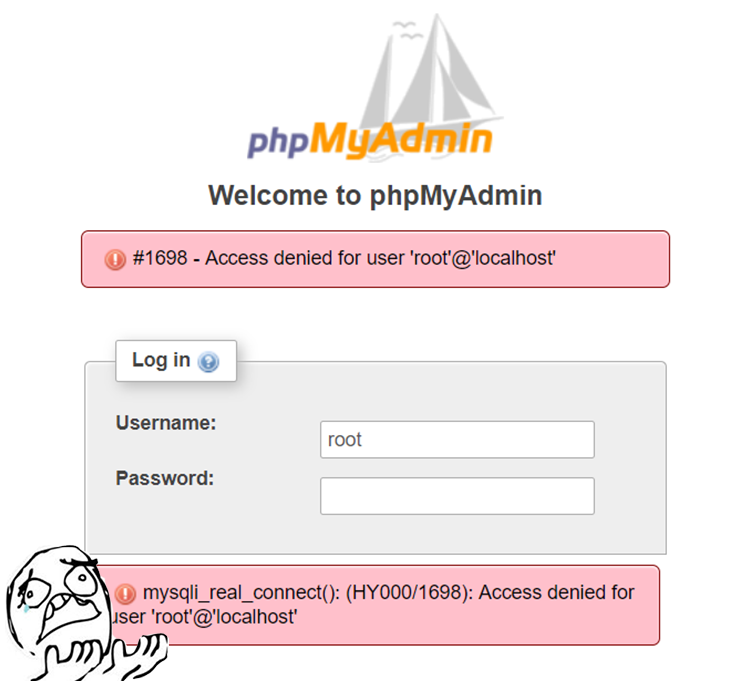 In MySQL 5.7 and above, root now requires sudo privileges and phpMyAdmin will not be able to use root credentials. It’s also not recommended that you allow the root account to be accessible remotely via phpMyAdmin as bots and hackers scan for these accounts continuously. Instead, create a new superuser account with a different username. In terminal, log in to MySQL as root. You may have created a root password when you installed MySQL for the first time or the password could be blank, in which case you can just press ENTER when prompted for a password. If you have forgotten your root password, you can always Reset the MySQL Root Password. Now add a new MySQL user with the username of your choice. In this example we are calling it pmauser (for phpmyadmin user). Make sure to replace password_here with your own. You can generate a password here. The % symbol here tells MySQL to allow this user to log in from anywhere remotely. If you wanted heightened security, you could replace this with an IP address. Now we will grant superuser privilege to our new user. You should now be able to access phpMyAdmin using this new user account. Did you forget the root password? If you have forgotten your root password, you can try reset it via command line. See: How to Reset the MySQL Root Password. Works well with phpmyadmin and mariadb ! Great, thanks ! I’ve been looking for two days for an answer. One post even suggested I completely uninstall MySQL and start over. This one worked perfectly. Apparently each version of MySQL has their own syntax. Mine never recognized the syntax from the other posts but took this one completely. I now have a password for my root as well. Thank You! You rock you saved my day ! Awesome information. Saved me a lot of time as a beginner. Thank you so much. I can’t believe! I spend all day working on this. Thank you! Thanks so much for the clear guidance, simple steps given and finally…… phpmyadmin running smoothly in my Raspbian Pi. Yesssssss, so clean, so easy, works beautifully. Excelente, gracias por la ayuda!!! THANK U SO NUCH IT WORK !!!!!!!!!!!!!!! I always can login as root before , but now in Ubuntu 18.04 it fail it not work. Soluzione ovvia ma non ci avevo pensato!